I apologize for being absent from the blog. I’m on summer break which will continue thru next week as I’m on vacation. 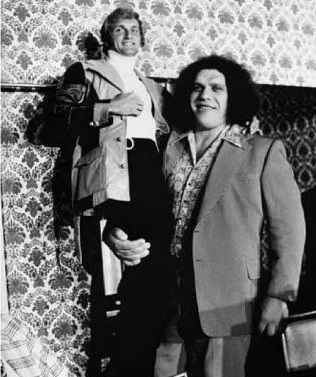 In the meantime, please enjoy this picture of Joe Theismann and Andre the Giant from 1975 at Duke Zeibert’s legendary restaurant in DC. The picture comes from The Redskins Encyclopedia by Michael Richman, which is obviously a book I need to purchase. I can’t help but look at this picture and picture Joe T as a puppet and Andre as a ventriloquist. That puppet would obviously have a lot to say and it would be in Andre’s voice…that would’ve been an awesome skit on SNL back in the day. I mean, doesn’t every ventriloquist puppet wear a white turtleneck?